A moderate solar flare on May 17 lit up ground stations all over the world with an unexpected and puzzling pulse of high-energy particles. It should not have happened, and scientists are now trying to figure out why it did. 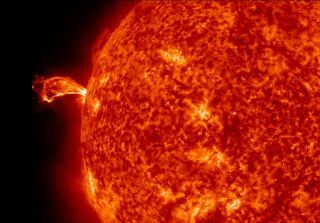 Major solar flares, flashes of light at various wavelengths often associated with coronal mass ejections (CMEs) are known to disrupt communications and can even trip power grids on Earth. But the May 17 flare was an M-class event, moderate and relatively common and not expected to create disturbances on the surface of Earth. Yet either the flare or the CME generated a ground-level enhancement (GLE), a blast of high-energy particles that lit up ground stations called neutron monitors on Earth for the first time in nearly six years. Scientists don’t expect an M-class flare to create a GLE. Data on the event was captured by the European satellite called PAMELA, or Payload for Antimatter Matter Exploration and Light-nuclei Astrophysics. Ryan is a co-investigator on the PAMELA mission, and hopes the spacecraft data will reveal how the high-energy particles morphed on their way to Earth and resulted in the mysterious GLE. Scientists don’t know if the extremely energetic particles registered on the ground are the results of a shockwave in front of a CME or if the particles come from the solar flare itself. Until the data is studied, however, the May 17 event remains a mystery.